Leaders from Acton Bridge Pre-school have launched a fundraising and marketing drive in order to keep their setting open. Based at the village’s parish rooms, the setting provides childcare for tots aged 2 and a half up to 5 years old. They currently have 7 children signed up to start in September but need an additional 3 children in order to be cost-effective. Trustees of the setting have agreed it can remain open for a further year, during which time they will aim to raise £5,000 so they can continue to operate even if no further children join. Cheshire West ward councillors have pledged £1,000 between them to fund marketing for the pre-school, in the hopes this will help them attract further children. They have been passing out leaflets in Weaverham and placed a banner in the village. They are also planning to put posters up in Norley, Crowton, Weaverham and Acton Bridge to promote the pre-school further. It is also putting fliers in the Acton Bridge newsletter, and is planning to have a pop-up stand at local shows and fetes. 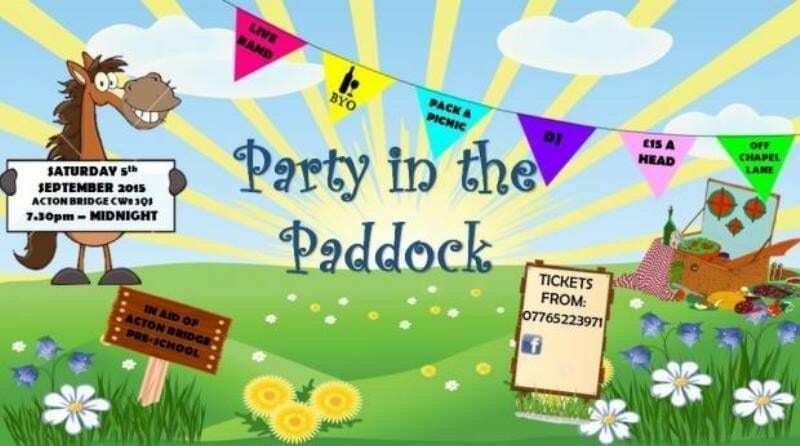 Rose said that they were looking to raise £3,600 of the target by Christmas and that the first fundraising event is Party in the Paddock on 5 September. The fundraiser in Chapel Lane, Acton Bridge, will feature a band and a disco, and tickets are £15, which are available from Louise Harris on 07765 223971. There are also plans for a Halloween children’s party and a Christmas fair. “We had a meeting at the parish rooms and agreed to carry on for another 12 months and to see how it goes,” said Rose. To contact the pre-school, call 07966 633011.